ETI proudly introduces the Snow Switch® CIT-2 Aerial Snow Sensor for surface ice & snow. Today, the world depends on highly reliable systems to provide uninterrupted communications, transportation, power distribution, and security. Meanwhile, Mother Nature is waging a never-ending battle against the best of these systems in the form of rain, snow, ice, changes in pressure and temperature, wind, dust and more. 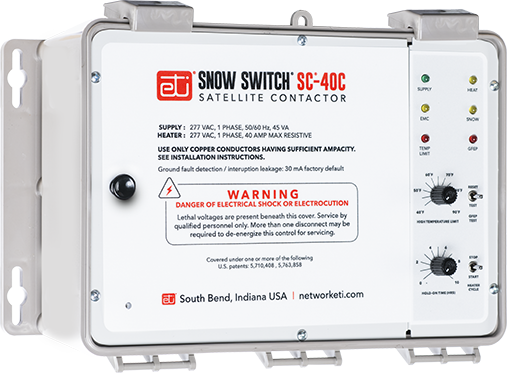 The SC–40C Satellite Contactor answers the need for cost effective modular snow melting heater control. One or more SC–40Cs, when used with an APS–4C Control Panel acting as the master control, allow for modular snow melting system design. The EDH–4 dehydrator addresses the need for a low cost, non-regenerating air dehydrator for pressurizing small volume waveguides and coax. It is especially suited for C, X, Ku, and Ka band applications.